Like many food products, there seems to be a variety of stories relative to the origination ofmustard. The name “mustard” is derived from a Latin word “must” which was an unfermented grape wine made potent and fiery with the addition of ground mustard seed. Some stories reference the Chinese growing mustard for more than 3,000 years, while others say that it originated in the Mediterranean, where it was cultivated for over 2,000 years by the Greeks and Romans. The Greeks and Romans used mustard not only as a condiment, but also medicinally, applying it externally for the relief of a variety of aches and pains. And of course, today, mustard plasters are still used by people to help relieve chest congestion. The Egyptians, it is reported, consumed mustard by popping a seed or two into the mouth while chewing meat, rather than making a powder or paste such as is used today. Another version goes back to the Romans who mixed the sweet must (unfermented grape juice) of new wine and crushed seeds which they called “sinapis” an earlier word which meant “mustard seed.” They called the resulting paste “Mustum Ardens,” or “burning must.” This in turn became “mustard” and the name stuck. In the fourteenth century, Pope John XII of Avignion became so devoted to mustard that he put it in every dish and even created a title, “Mustard Maker to the Pope” when trying to figure out what to do with a good-for-nothing nephew from Dijon. In 1336, when the Duke of Burgundy invited his cousin, Philip the Fair of Valois, King of France, to a festival, 70 gallons of mustard were consumed at a single dinner. Generally, people used to consume a lot more mustard than they do today. For example, in the books of a 13th century Tudor household were listed expenses for seven to ten gallons of mustard monthly. There are many varieties and grades of mustard seeds, but there are only two basic types — 1. yellow seed is very mellow with little heat; and 2. oriental and brown seed, which is hot to very hot. With mustard, heat and flavor mean the same thing. Ninety-five percent of all wet mustard is made from a blend of yellow and oriental mustard. Ball park mustard is primarily yellow. Seasoned specialty mustards are the oriental and/or brown seed products. When mixed with water, an enzyme reaction causes all mustard seeds to become hot. With the yellow seed, the heat lasts only about 24 hours unless preserved. The oriental seed keeps its heat. Mustard flour is made from the seed with the bran removed. It is similar to wheat flour and about 70% of white mustard is made from seed rather than flour. Mustard flour from the yellow seed is generally used in mayonnaise. There is no pungency to mustard until the seed cells are broken and liquid is added. The chemical reaction that occurs as a result produces mustard oils which are potent and release heat. Heat diminishes the mustard’s bite, so you’ll most likely find that in cooking with it, it is generally added to the dish toward the end. Mustard gives depth and binding to sauces and helps to emulsify the oils in mayonnaise and vinaigrettes. Today, most of the world’s supply is grown on the Canadian plains. The only European countries with significant mustard crops are England and Hungary. American mustards are usually made from yellow mustard seeds as contrasted to brown mustard seeds which are considered zestier and more flavorful or hot than yellow. It is not the mustard seed that makes it yellow, however, it is the addition of tumeric that gives the condiment its distinctive color. There are many flavorful stories about how mustard has become a truly international seasoning. The flavor and appearance of mustard varies among countries according to local cuisine and manufacturing processes. While American mustards commonly are considered ball park mustards which are made from the yellow mustard seed, more and more specialty/gourmet mustards are appearing on grocery store shelves. Mustard is low in calories and cholesterol and the mustard seed is high in protein and minerals including calcium, magnesium, potassium and niacin. Mustard is in the crucifer family which includes turnips, radishes, horseradish and watercress — all foods known for some degree of heat. Researchers at the U.S. 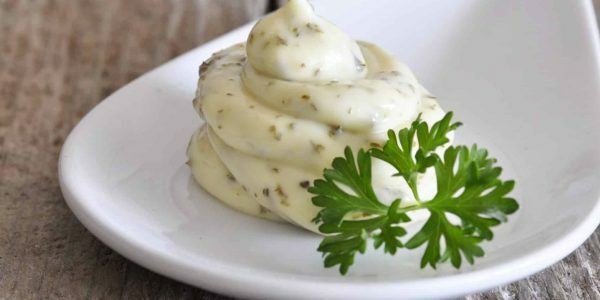 Agricultural Research Service (ARS) and Oklahoma State University have shown that both horseradish and mustard oil protect against Listeria, E. Coli, Staphylococcus aureus and other food pathogens because these condiments contain allyl isothiocyanate (AITC). Mustard oil has 93 percent AITC, while horseradish contains 60 percent AITC, according to the ARS research published in the Journal of Food Science (vol. 63, no. 4, 1998). Mustard, called “the spice of nations,” is cultivated all over the world, and has been for centuries. Almost every culture has a mustard and as Americans experiment more with different ethnic cuisines, new mustards play a part. Despite the proliferance of international mustards on the shelf, the number one mustard type in America is still the sweet-hot variety, according to Barry Levenson, executive director of the World Mustard Association and curator of the Mustard Museum in Mt. Horeb, Wisconsin. “Fruit-flavored mustard is big,” says Levenson. “Name a fruit and there’s a mustard with it.” Consumers are also loyal to their regional flavors, he notes, including Southern vidalia mustards, Northeastern cranberry mustards and Northwest herb mustards, to name a few. Two increasingly popular roots, wasabi and horseradish, made into condiments, are often lumped in with the mustards on store shelves. Horseradish is a particularly pungent root often added to mustards. Wasabi is a bright green paste made from a Japanese-type of horseradish root. For more information on horseradish, visit www.horseradish.org. For some, mustard is the generic yellow stuff you squeeze out of plastic containers onto hot dogs at the ballpark. For others, it’s that sensory-overloading section of the grocery store. Sure, you thought a simple Dijon was all you wanted, but then a jar of coarse-grained jalapeno mustard or a sun-dried tomato blend caught your eye and you were stymied by the choices-estimated at nearly 1,000 on the American market today. That’s a long way from the mustard’s humble medicinal uses in poultices and plasters. The French, though, recognized early on the use of the seeds of this handy, leafy plant for cooking, and by the 14th century, the city of Dijon had established itself as a mustard-production center, relying mostly on plants grown in the Burgundy region. In 1853, the art of mountarde was advanced several notches when Maurice Grey came up with an efficient little machine that could both grind and sift mustard seeds. He subsequently hooked up with Auguste Poupon, and the rest is prepared-mustard history. On a parallel course in England, Jeremiah Colman was perfecting his still-exemplary mustard powder; only later in the 19th century did the British enthusiasm for prepared mustards develop. For Americans, on the other hand, French and English mustards were a not-so-readily acquired taste. We were converted at the beginning of the century when Francis French tweaked the pungent European recipes and toned them down to suit the American palate. His ubiquitous yellow version is still the mainstay for the company that bears his name, but a spirit of mustard adventurousness has definitely spread, so to speak, across the land. We overwhelmingly favor the sweet-hot, tangy versions and the Dijon blends, but even those can come in seemingly endless permutations. Although mustard can be grown almost anywhere with a cold climate, most of what we buy today-including most French imports-comes from the prairie provinces of Canada. California’s Napa Valley is famous as a mustard center because of the annual Napa Valley Mustard Festival, but the seeds from those plants are not harvested. The crop instead serves as a soil-enriching ground cover for the region’s vineyards. The festivals’ competitions, cooking exhibitions, and tastings, held from February to March, use the seasonal bloomings of those gloriously golden mustard fields as a way to attract tourists during an otherwise slow time. In a small bowl, combine all ingredients, mixing well until smooth. Cover and let stand for 30 minutes for flavors to combine. Serve as a condiment for hot dogs, grilled chicken or vegetables. Note: Mustard may be covered and refrigerated for up to two weeks. Yield: 1 ¼ cups. In a food processor, combine all ingredients until smooth. Use as a condiment for hot dogs, ham or cold cuts. Note: Mustard may be covered and refrigerated for up to two weeks. Yield: 1 ¼ cups. In a small bowl, combine all ingredients, mixing well until smooth. Cover and let stand for 30 minutes for flavors to mellow. Serve as a condiment for seafood, poultry or beef. Note: Mustard may be covered and refrigerated for up to two weeks. Yield: 1 ¼ cups. In a small bowl, combine all ingredients. Cover and let stand for 30 minutes for flavors to blend. Use as a condiment for hot dogs or other sausages. If desired, add prepared sauerkraut to the sandwich along with the Bavarian Mustard. Note: Mustard may be covered and refrigerated for up to two weeks. In a small bowl, combine all ingredients, mixing until smooth. Use as a dip for fresh vegetables or chilled seafood. Note: Mustard may be covered and refrigerated for up to one week. Yield: 1 ½ cups. In a small bowl, combine dry mustard and white wine. Let stand for 30 minutes. Add remaining ingredients. Whisk until smooth. Cover and refrigerate until used. Serve as a sauce for crab claws, shrimp, or lobster. Note: Mustard may be covered and refrigerated for up to one week. Yield: 1 ¼ cups. In a small bowl, combine all ingredients until smooth and well combined. Serve as a dip for chicken fingers or as a sandwich spread. Note: Mustard may be covered and refrigerated for up to two weeks. Yield: 1/3 cup. In a food processor, blend garlic, egg and anchovies to a smooth paste. Add remaining ingredients and pulse on/off until mixture is smooth. Refrigerate until serving time. Serve as a sauce for fish, meat or shrimp. Yield: ¾ cup.